An exhibition of Henri Matisse's cut-out art has become the most successful exhibition held to date at the Tate with more than 560,000 visitors. The Tate Modern show was the first in its history to attract more than half a million people. 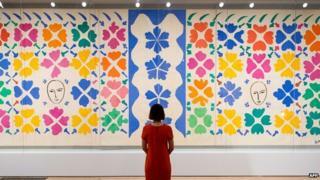 Matisse: The Cut-Outs drew attention to the final part of the French artist's career from 1937-54. Sir Nicholas Serota, director of the Tate, said he was "delighted" at the show's success. "The fact that the works have not been brought together for 40 years captured people's imaginations," he said. The exhibition opened on 17 April and came to a close on 7 September. While the large-scale exhibition of Matisse's later work did "slightly exceed expectations", this summer's Kenneth Clark - Looking for Civilisation show "did not quite get as many visitors as we hoped", Sir Nicholas admitted. Not every Tate show could expect "a very large" attendance, he added. "Part of our responsibility is to open up new areas of enquiry and to throw light on work that has been forgotten." Previous record attendances for Tate attractions were for the Matisse Picasso show in 2002, which drew 467,166 people, followed by Damien Hirst's 2012 exhibition which brought more than 463,000 visitors through its doors. A live tour of the Matisse exhibition was also broadcast in some 200 cinemas around the UK and initially pulled in 15,000 people. A film of Matisse Live is due to be released in screening rooms around the world shortly. The Tate has also announced plans to tour some of its key works around the country, including Tracey Emin's hallmark 1988 piece My Bed. Her then controversial work, which sold for £2.2m at auction earlier this year, will be displayed in her hometown of Margate at Turner Contemporary as well as Tate Liverpool. Sir Nicholas told the BBC that Emin herself would initially install the artwork, which features an unmade bed and a floor littered with empty vodka bottles, cigarette butts and condoms. "We have a extremely competent team of technicians and conservators who will map that piece very carefully so we can install it elsewhere without Tracey's necessary involvement, although I suspect she will turn up in Margate when it goes there," he said. Matisse's The Snail will be exhibited at Tate Liverpool, marking the first time it has been shown in the UK outside London. Artworks by Picasso, Constable and David Hockney will also be exhibited around the UK as part of the the scheme. Tate's annual report, published on Monday, showed that 7.03 million people visited the four galleries - Tate Britain, Tate Modern, Tate Liverpool and Tate St Ives - in 2013-14, down from the previous year's record 7.74 million. "We will always expect to see a fluctuation year to year," Sir Nicholas said. "The general trend is to see more and more visitors seeing works from the Tate's collection - not just in London, but elsewhere."